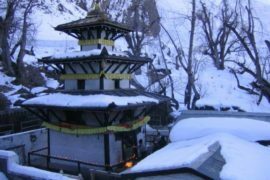 (Muktinath TempleTour) Muktinath is Sanskrit name, itself has religious overtone and a sort of emotional ring to it for the devout Hindus. This words separation two word Mukti & Nath. Mukti mean Salvation and Nath mean god and Nirvana so It holds great significance for all spiritual people in the south Asian sub continent. Muktinath (the provider of salvation) has been one such holy site, where thousands of devotees flock for attaining the much sought after moksha( freedom) from the cycle of birth and rebirth. It is an ardent wish or a dream if you may say, of every Hindu to get Mukti-Nirvana from this cycle taking births over and over again. It is belief of the Hindus that this world is “MAYA” (an illusion) and the earliest one gets out of it the better and a visit to Muktinath will help them achieve that goal. Since then it called Muktinath. It is believed that one should visit this temple after completing pilgrimage of four special religious sites, Chardham Yatra of India; Muktinath must be visited once. The famous Muktinath is a sacred & important pilgrimage place both for Hindus and Buddhists. It located in Muktinath Valley lies in the district of Mustang and is situated about 18 kms. Northeast of Jomsom in the north central part of Nepal, at an altitude of about 3800 meters at the foot of the Thorong La mountain pass (part of the Himalayas). The holy shrine at Muktinath is in a grove of trees and includes a Buddhist Gompa and the pagoda style temple of Vishnu Mandir, Containing an Image of Vishnu The site is close to the village Ranipauwa, which sometimes mistakenly is called Muktinath as well. Named after highly referred Muktinath shrine the valley is one of religious place in Nepal for both Hindus and Buddhist. Hindus call it Muktichhetra (Place of salvation) is one of the four religious sites & It is also one of the 51 Sakti peetams. Some people called this place Salagrama, Many Shaligrams found here are considered by Hindu as incarnation of lord Vishnu and worship them. According to Hindu Myth lord Vishnu turned into Shaligram because of Brinda’s Curse. South Indian people called this place “Muktidham” It means holy pilgrimage place of salvation. Most of South indian People compulsory to visit this place in their life. Similarly Buddhist calls this valley the Chumig Gyatsa which in Tibetan means ‘Hundred Waters’. For Tibetan Buddhists Muktinath-Chumig Gyatsa is a very important place of Dakinis, goddesses known as Sky Dancers and one of the 24 Tantric places. They understand the Murti to be a manifestation of Avalokitesvara. The Tibetan Buddhist tradition states that for this reason Guru Rinpoche, also known as Padmasambhava, the founder of Tibetan Buddhism, had meditated at Muktinath he gained lifetime achievement of spiritual knowledge here while on his way to Tibet on 12th century. Hindu regards Muktinath as Vishnu where as Buddhists regard as Buddha. Hindu believes that lord Vishnu got salvation from curse of Brinda (wife of Jalandhar) here. Therefore he is worshipped as Muktinath (Lit. the lord of salvation). On the other hand Buddhist worships Vishnu as Avalokiteshvara. The waterway downstream from Muktinath along Kali Gandaki is the source of all Silas or Shaligrams that are required to establish a temple of Vishnu anywhere in the world. It is considered to be one of the holiest places of pilgrimage of Hindus, Buddhists, and Vaishnavas. It has 108 water springs and this number carries great significance in Eastern philosophy. In Hindu astrology, there are 12 zodiacs or Rashi and 9 planets or Graha, giving a total of 108 combinations. Also there are 27 Lunar mansions or Nakshatras which are divided in 4 quarters or Padas each giving a combination of 108 Padas in total. Here in the early 19th century the Hindus consecrated a Vishnu temple and named is Muktinath – Lord of Liberation. Against a backdrop of incredible starkness you can sit and stare to the south the snow covered Annapurna range, or to the north the Tibetan plateau. The temple is very small. Muktinath is one of the most ancient Hindu temples of God Vishnu. The Pagoda style Muktinath Temple is symbol of the religious symbiosis between both Hindus and Buddhists. Hindu regards Muktinath as Vishnu where as Buddhists regard as Buddha. 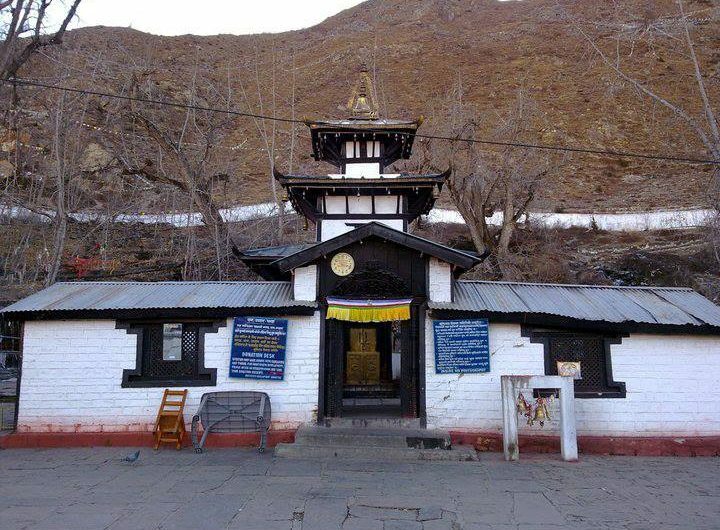 The main shrine of Muktinath is a pagoda – shaped temple dedicated to the Lord Vishnu. The statue is of gold and is tall enough to compare with a man. The Statue is of gold and is tall enough to compare with a man. The depicts metal statues of lord Vishnu, goddess Laxmi, Saraswoti, Janaki, Garuda, Lava-Kush and Sapta Rishis. Gomba: After completing prayer and puja at the temple a visit to Mharme Lha Khang Gomba, the monastery dedicated to Guru Rimpoche (Padmasambhava) with his huge image situated to the North of Muktinath Temple. It is quite difficult to travel because of tough weather conditions. Only those who are willing to undergo physical discomfort and rigor can go to Muktinath. Above all, one should have the Grace of the Lord to visit Muktinath. The convenient routes to Muktinath from India are: via Gorakhpur, Sonauli, Bhairawa and Pokhara, the last big town on the way to Muktinath; via Raxaul, Birgunj and Pokhara or via Darjeeling, Siliguri, Kakarvitta and Pokhara. There are many ways to reach Muktinath. Either take a flight from Kathmandu to Pokhara and then fly from Pokhara to Jomsom, hike for 7-8 hours from Jomsom all the way or take a jeep to Ranipauwa near by Muktinath. Also the Bus services are available from Pokhara to Beni, from Beni to Ghasa, via Tato pani, Marpha, Tukuche to Jomsom there is Jeep services which take time 8-10 hrs. And from Jomsom to Muktinath it takes 2.30 hrs by Jeep. After Beni to Jomsom to Muktinath the road is graveled through the Kaligandaki river bank & Hill area. There is helipad nearby temple; the charter helicopter services are available from Pokhara & Kathmandu all the way to Muktinath which takes around forty five minutes to reach from Pokhara and 2.30 hrs from Kathmandu. The helicopter can be hired only when the weather permits. Arriving by helicopter for a longer period of stay is not recommended because of the risk of acute mountain sickness. The sight of the bewildering Annapurana and Dhaulagiri ranges will enchant you as you approach towards Pokhara Valley by air or surface. The next morning when you discover the clear sky and views of mountain, you then discover you are on your special journey to the Muktinath. Apart from walking to Muktinath all the way, there are many ways one can travel, depending on time and budget. By Helicopter to visit Muktinath on the month of March to October is best time but 12 Month is possible. By treks to visit on the month of April to October is preferable but 12 month possible. Jomsom & Kagbeni is main gateway of Muktinath. The Muktinath valley has seven historic famous places Putak, Jhong, Chhyokhar, Purang Jharkot and Khinga. Ranipauwa (Lit.Queen pilgrims hostel the name of Subarna Prabha Devi) is new settlement village founded by people of Purang. There are many monasteries and Gompa around the Muktinath temple. Muktinath and its valley are located in the Mustang Bhote region. The climate and landscape here are similar to those of the Tibetan Plateau since it is situated in the rain shadow of the Greater Himalayas. The changes in climate from warm to cold take you to the sacred shrine of Muktinath in Mustang district. Flowing through the region from north to south and forming deep gorges is the Kali Gandaki river, which as its name implies (kali = black) is a black river – the black stones of the riverbed and black soil contributing to the effect. The high altitude landscapes made for unique and scenic environments. The climate was cold and the land was dry. The temperatures in summer (March to August) hover between Maximum of 22 to 24 degree Celsius and Minimum 12 to 16 Degree Celsius. In the beginning of winter (September to November) the Maximum temperature fluctuates between 16 to 18 degree Celsius and Minimum Temperature will be between 0 to 4 degree Celsius. In the winter (December to February) the maximum temperature will be 6 to 10 degree Celsius and minimum 0 to -6 degree Celsius. The most suitable time to visit Muktinath from March to May & October. In November & February it can be cold, but you can travel. December and January are for the diehard & snowfall in the all of area 4 to 10 ft. June to September is raining season. As the weather conditions would not be safe enough to travel in other months. Days are relatively warm; especially when there is no wind in the late morning. The appropriate clothing as per the travel period (temperature) . We suggest you to take normal warm clothes. Light warm jacket, woolen sweater, warm T-Shirts, comfortable shoes, trousers and cotton pants are enough for this trip. We recommended you to bring down jacket for the winter. • Entitled to carry only 15 kgs per person on flight. There is enough Hotels and lodges near by Muktinath in Jharkot and Ranipauwa. The Hotels and lodges are fine there. Some Hotels have solar heated hot showers and provide rooms with attached bath. Also local restaurant are available there. They provide good food. For Hindu pilgrims there are also free Dharamsalas. Muktinath lies in the Annapurna conservation area where entry fee required. Entry fee can be obtained from Kathmandu and Pokhara. The ACAP entry fee is Rs. 200.00 Per person for Indians and others SAARC nationals and Rs. 2000.00 per person to others foreign nationals at the above mentioned designated place. An equal extra fee will levied if permits are issued from field check post. The Permit is non-transferable and is valid for single entry. Children below 10 yrs. need not entry fee. A copy of the passport and 2 copies of passport size photos are required while applying for the permit. As trek is time taking thus trek would not possible for our entire guest for one or another reason. Hence, we are pleased to introduce a same day Darshan Muktinath by helicopter. Previous postHow to travel Muktinath Temple ? 锘? vmate is definitely instance that lets you export [url=https://www.vmate.com/]vmate[/url] motion pictures not to mention songs within Youtube, Metacafe, Vimeo, Soundcloud in addition to the anywhere from several other very popularly used multimedia systems online sites. this key fact iphone app allows grab a variety of videos quite possibly songs of numerous elements. sure, feasible acquire associated with decent in video training or sometimes songs that you intend to. it is possible to download and install full hi-def (harley-davidson) movie clips on this site that. All standard and dealing download and read websites are provided over here and then you don鈥檛 worry about that by any means. It will let you pay attention to the training videos on the other hand songs straight up whilst not having them to be [url=https://www.vmate.com/]vmate[/url] saved. best free download - vmate application. Could you inform me what theme are you making use of on your internet site? It looks good. Do you have any suggestions for creating posts? That's where I constantly battle and I simply wind up gazing vacant screen for long period of time. I discovered your website from Google and also I have to state it was a fantastic find. Many thanks!